It’s that time of the year again, when you and your loved ones pick the perfect tree to decorate and celebrate the Christmas holiday. This year, like previous years, my friends and I went to select our trees. But unlike years past, this time we decided to cut our own trees instead of buying them at the grocery store. Having worked for American Farmland Trust for close to two years, it was important to me that we spend our money on a local farm. 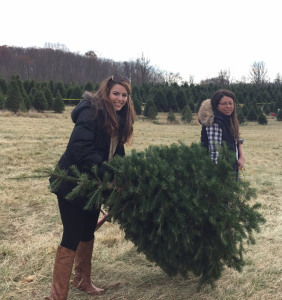 I did some research and found a family-owned farm not too far from Washington, D.C., that grows “cut your own” Christmas trees. The weekend after Thanksgiving, we piled in the car and drove 30 minutes away from D.C. to Butler’s Orchard in Germantown, Maryland. When we arrived, the parking lot was full and there were families, couples and young people like us selecting the best trees, taking pictures, enjoying hot cider and roasting marshmallows. We saw fields with rows upon rows of green Christmas trees. The saws we needed to cut our own trees were all gone, so we had to wait until another customer came down the hill with their Christmas tree in order to get a saw and go on our adventure. The farm had two separate fields—one with rows of Frasier Fir and the other with Canadian firs. After looking over the two fields, we all decided that we would select a tree from the Canadian fir field. 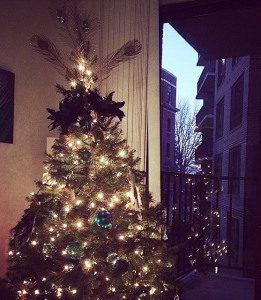 For my apartment, I selected a five-foot Canadian fir that was the perfect size. My friend and her husband selected a small two-footer since they have a toddler and needed to set up the tree on a table. The farm was busy, and it’s no wonder that U.S. sales of Christmas trees amounted to about $306 million in 2012 (Census of Agriculture, 2012). After a wonderful day selecting our trees, and the ten-minute workout needed to cut them down, we drove back to D.C. to decorate and enjoy some hot apple cider. Enjoy making your own tree selection this year, or celebrating your own seasonal traditions. Happy holidays. According to the 2012 Census of Agriculture, there are 15,494 farms nationwide growing Christmas trees on over 309,365 acres. 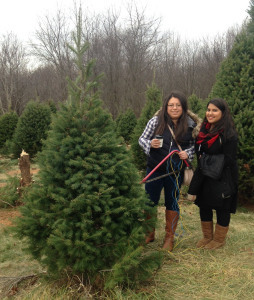 This entry was posted in Farmland Protection, Local Farms and Food, Maryland, Uncategorized and tagged Christmas Trees, Family Farm on December 16, 2014 by Anelkis Royce.